UK front gardens are brimming with untapped potential. Walk down any residential street and you’ll see neglected outdoor spaces lining the pavement. They’re ready and waiting to be transformed into practical yet beautiful front gardens for their owners to enjoy. The area in front of your home is all too easily overlooked in favour of your back garden. However, it’s worth bearing in mind that your front garden is permanently on display to the public and frequently in use. It makes sense to ensure that the area makes a good impression on everyone who sees it. What’s more, devoting time and attention to the design of your front garden will really help you to make the most of the available space. If you’re looking for inspiration, read on to discover some of our favourite front garden design ideas and tips. They can help you to take your front garden from average to amazing! During the design process, think carefully about your front garden’s different uses and how you can reflect them in the landscaping. For example, you could delineate specific areas for parking, walking and relaxing with the aid of different ground coverings. 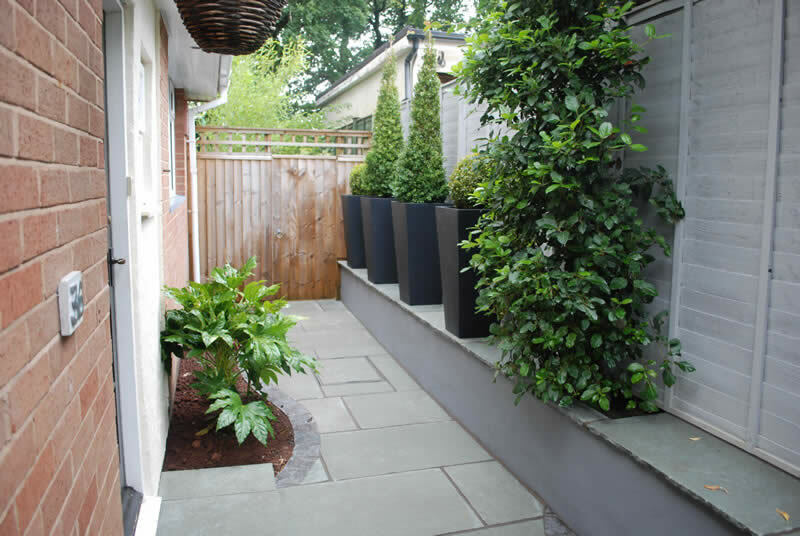 Multiple levels are an excellent option when you want to make a small front garden look bigger, as well as increase its visual impact. 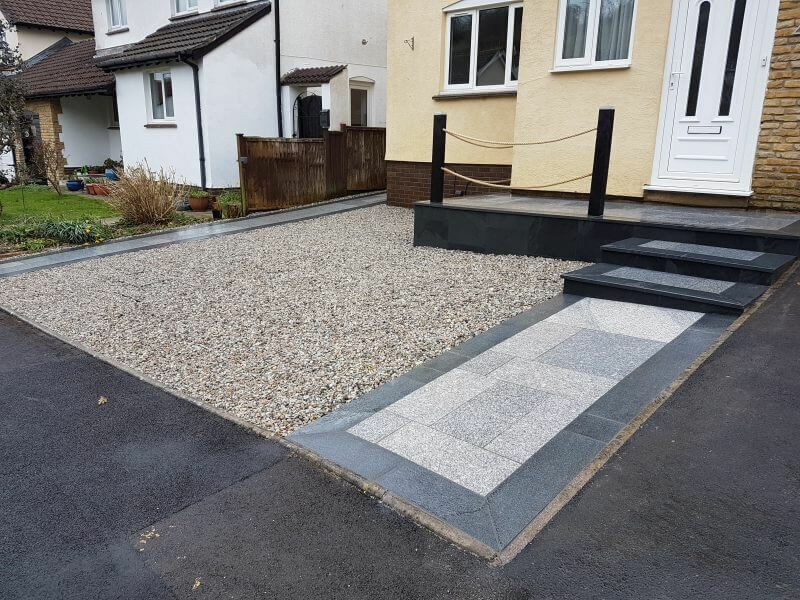 That’s the approach we took when transforming the compact areas by the entrances to two homes in Newton Abbot. Think of re-designing your front garden as an opportunity to make the space work for you, showcase your style, boost your property’s kerb appeal and add value to your property. 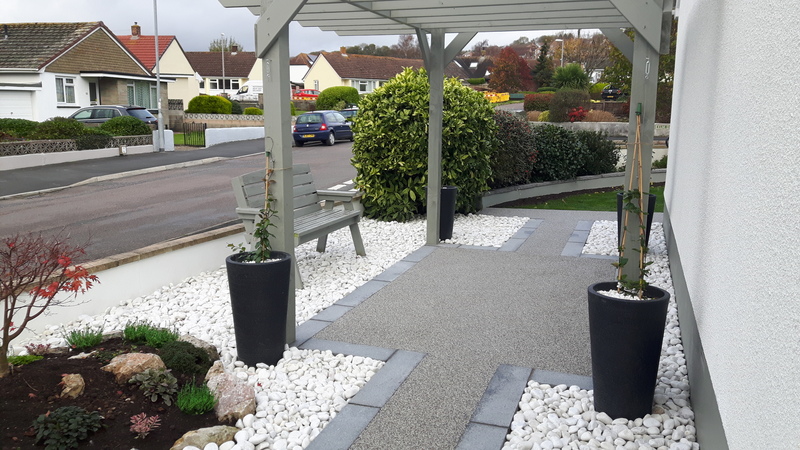 Most front gardens feature paved areas, so why not make yours the talk of the street with luxury paving? Italian porcelain and calibrated Versuro sawn are just two examples of our beautiful, natural paving stones. They bring a touch of luxury to outdoor areas. 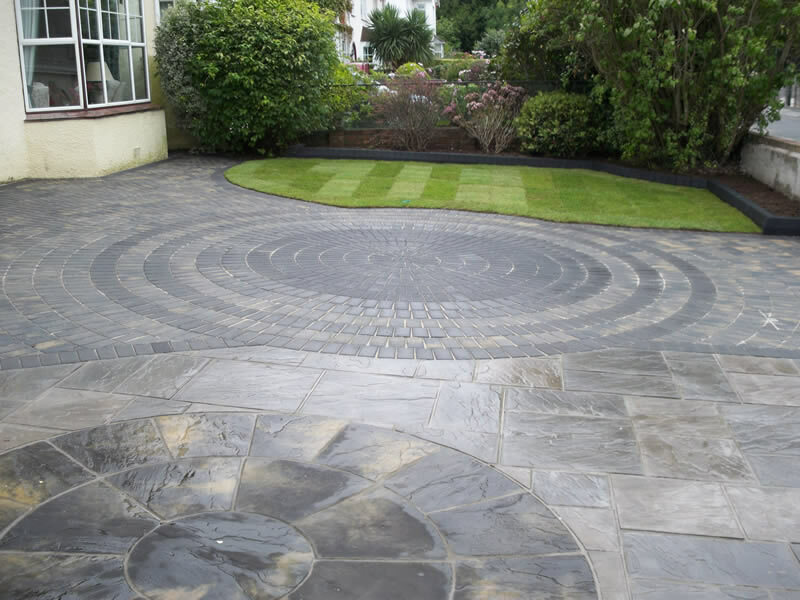 Liven up your driveway with the addition of eye-catching motifs, such as the attractive circular designs we incorporated into a client’s front garden. They make great focal points. Instead of run-of-the-mill flowerbeds, add custom-made planters to your front garden for a more sophisticated appearance. Popular choices of material include timber and granite. You could display planters on each side of your front door to create a formal, elegant entrance. Adding fairy lights or uplighters is a brilliant way to highlight their chic style. Who doesn’t want their front lawn to look lush whatever the weather? By far the simplest way to achieve this is to replace tired turf with realistic artificial grass. Then you can enjoy vibrant green grass all the time, without the need for watering or mowing. When selecting plants for your front garden, remember that the area needs to look attractive the whole year round. House Beautiful’s guide to flowers for each season is a helpful starting point when you’re choosing what to plant. Get the balance right and you’ll always have seasonal flowers in your front garden – and no sad, bare patches! Outdoor seating isn’t just for back gardens – create a relaxing spot in your front garden with a bespoke timber bench, designed to complement your property. We like to complete the look with a tailor-made pergola and climbing plants. For a truly memorable front garden, grow plants with wonderful scents near the areas people pass by most often, such as the porch, gate and garden wall. Lavender, roses, peonies and hyacinths will fill your front garden with fabulous fragrances. There’s a lot to think about when re-designing outdoor spaces, so why not call on the experts? Our award-winning team offers a complete garden design and construction service in Devon and the rest of the South West. We can fulfil your front garden’s potential, whatever its size, shape or style. To book a consultation, please call Jackson’s Landscape Design today on 01626 332533 or contact us online.